The Samsung Galaxy Alpha is a surprising change in the Samsung product strategy. It certainly has many of the Galaxy S5 key selling features, while staking on more premium material such as aluminum. But it's not another flagship, no, it's rather an offshoot of the Galaxy family tree - something that the Galaxy S5 mini could have been but is not. A strange bird, indeed. That certainly doesn't mean we don't like it. Just on the contrary. 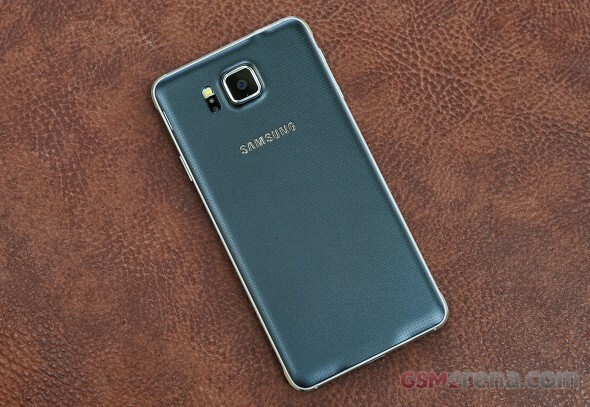 The Samsung Galaxy Alpha presents a nice departure from the Galaxy S5 design language. The sides are machined out of aluminum, while the back no longer imitates faux leather. The Galaxy Alpha has a smaller screen than the S5 to make it much more pocketable and also, undoubtedly, to allow it to compete with the iPhone 6 directly. Here's what makes the Samsung Galaxy Alpha tick. The Samsung Galaxy Alpha is surprisingly light, it feels sturdy and the back looks like it could take a lot of beating before it gets seriously scratched. The latter benefit is certainly something we've missed in high-end smartphones that we've seen lately. Our biggest regrets in the specs department are the lack of water-proofing and the lack of a microSD card slot. We've got the smartphone for a few days to keep us company and we thought that we might as well come up with this quick preview of the Samsung Galaxy Alpha, so you can have something to chew on, while we are hard at work on the full review. Enjoy! Samsung's shift in design has to be felt to be believed. No, really, on the outside the Samsung Galaxy Alpha is very similar to the Galaxy S5 mini. A keen eye will notice that the bezels above and below the screen are smaller, accommodating the bigger screen. The Alpha is also considerably thinner, if that's not obvious at first glance. Of course, the major upgrade to Samsung's design language here is the metal chassis. The sides of the _phone_ are exposed metal while the front and back are covered in glass and plastic, not unlike Apple's iPhone 4 / 4s and Sony's Xperias. The Galaxy Alpha will inevitably draw comparisons with the iPhone - the flat metal sides are segmented by thin lines of plastic and look so familiar. Samsung's design features flared corners which improve handling a bit by preventing your fingers from slipping off the curved edge. They also remind us a bit of the Samsung Galaxy S5 Active. The back of the phone is plastic, with the dotted pattern of perforated leather similar to the Galaxy S5 though here the pattern is subtler and looks less like leather. While the plastic isn't the most premium variety, the Samsung Galaxy Alpha impresses with a mere 6.7mm thickness. It's the slimmest Galaxy device to date though not the slimmest smartphone in general. The feeling of compactness is helped by the weight of 115g, few 4.7" phones weigh this little. The Galaxy Alpha feels tiny compared to the current crop of 5" flagships. The Galaxy Alpha also compares favorably against the iPhone 5s, which measures 7.6mm thick and weighs 113g. The iPhone 6 is expected to be bigger and thinner than its predecessor but it remains to be seen if Apple can keep the weight in check. And it's the upcoming iPhone that Samsung has in its sights, not the 5s. We can only guess that the secret behind the reduced weight is the lower battery capacity, which in this case amounts to only 1,860mAh. Indeed, the battery is removable, but the capacity is less than adequate. The front is made of glass though Samsung has not yet revealed whether it's the usual Gorilla Glass or not. Under the glass is a plastic that matches the back in terms of color and the fine dotted pattern. The Galaxy Alpha will be available in Charcoal Black, Sleek Silver, Dazzling White, Frosted Gold and Scuba Blue. The front of the device features an earpiece, the usual bunch of sensors (proximity, ambient light and Air Gesture) and a notification LED. There's also a 2MP/1080p camera above the screen. Nothing has changed below the screen either, a hardware Home key is flanked by capacitive App switcher and Back keys. The Home key has a fingerprint scanner, which can be used to lock the phone and authorize transactions (it's PayPay-certified). It also enables Private mode, which gives you access to a secure part of the storage where you can keep sensitive data and photos. The sensorama tour continues with a heart rate monitor on the back. It's placed next to the camera and shares a small black plate with the LED flash. The camera itself protrudes slightly from the back of the phone, extending past the 6.7mm thickness. It has 12MP resolution and can record 2160p video, more on that later. The back panel can be removed to expose the 1,860mAh battery. It's user-replaceable but is relatively small even for a phone this size. We guess sacrificing battery capacity is part of how Samsung got the Galaxy Alpha down to this thickness and weight. Ultra Power Saving Mode is available for when battery charge gets too close to 0% for comfort. Anyway, under the back cover you'll find a nanoSIM card slot but no microSD. The phone comes with 32GB of storage and that's all you're getting (there's no 64GB version announced yet). The bottom of the phone features a microUSB 2.0 port, a microphone and the grille of the loudspeaker. Positioning the loudspeaker here means it won't get muffled regardless of how you put the phone down (face up or face down) but is bound to draw even more comparisons with the iPhone. Note that the Galaxy Alpha is not water resistant like its Galaxy S5 siblings. The top of the phone features the second microphone and an exposed 3.5mm audio jack. What's missing is an IR blaster, which both the big Galaxy S5 and S5 mini have. The metal sides of the phone have one hardware control each - the Power button on the right and the Volume rocker on the left. Both are made of metal and are slightly too thin for our liking, it makes pressing the keys slightly more difficult. Among the sensors packed inside the Samsung Galaxy Alpha is a Hall sensor, normally used to detect the opening and closing of covers. Samsung hasn't announced any dedicated Alpha covers yet but it would be interesting to see if they'll have a premium feel to them compared to regular S Covers. Note that there doesn't seem to be a barometer or humidity sensor either. The Samsung Galaxy Alpha comes loaded with wireless connectivity features. It starts with LTE Cat. 6 (up to 300Mpbs down, 50Mbps up) to match what the latest Snapdragon 805 can offer. Regular 2G and 3G connectivity is of course supported, too. Local connectivity is no slower, the phone packs a MIMO (2x2) antenna setup for dual-channel connectivity. That's different from dual-band (which the Alpha also has), it means that it can use the 80MHz Wi-Fi band instead of the usual 40MHz, for enhanced speed. Wi-Fi a/b/g/n/ac standards are supported. Other local connectivity includes Bluetooth 4.0 LE and ANT+, both of which are low-power and can be used to connect with wireless sports accessories (to be used with the S Health app or third-party apps). NFC rounds off the wireless connectivity section. The Galaxy Alpha relies on a standard microUSB 2.0 port for charging and wired data connectivity. USB 3.0 ports are rare and require a fairly large adapter. What we do miss here is wired TV out either via MHL or SlimPort. 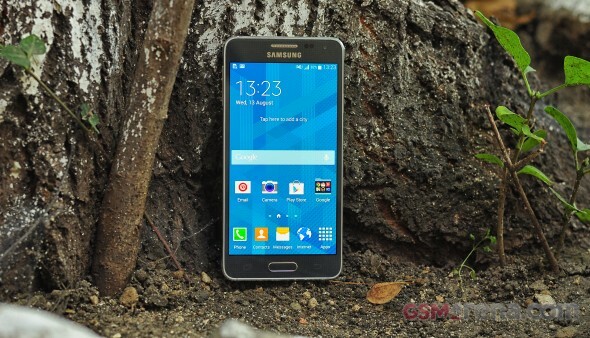 The Samsung Galaxy Alpha is the first device with Exynos 5 Octa 5430 that we've tested. The chipset features a big.LITTLE processor with four Cortex-A15 cores and four Cortex-A7 cores clocked at 1.8GHz and 1.3GHz respectively. All eight can run simultaneously so we can expect great multi-core performance. The chipset also packs a hexa-core Mali-T628 MP6 GPU, the latest currently available Mali design. Processor and RAM share 2GB of RAM. The Samsung Galaxy Alpha comes with Android 4.4.4 KitKat out of the box. Note that Samsung disables the ART runtime in its TouchWiz software, that's the faster optional runtime that debuted with KitKat and will be made default in Android L. An increasing number of apps is becoming compatible with ART. With technical specifications out of the way, let's pit the Galaxy Alpha against flagships and high-profile minis. Of the minis only the Xperia Z1 Compact has a chance of competing here, the others are powered by mid-range Snapdragon 400 chipsets. We start off with the Basemark suite of cheat detection software. We're pleased to report that Samsung hasn't gone back to benchmark shenanigans. The Basemark tests are good for comparing performance, too. Basemark OS II leans on the CPU and puts the Galaxy Alpha within spitting distance of the LG G3. The breakdown shows great single-core performance and unmatched multi-core performance (all 8 cores working at once does make a difference). The multi-core score from Geekbench 3 confirms the finding that the Alpha tops Snapdragon 801-based phones in multi-core performance. The total Basemark OS score is a bit low, considering the CPU scores. AnTuTu 4 shows a lot more love for the Galaxy Alpha and places it second behind the Oppo Find 7 but ahead of the Galaxy S5 and other flagships. We've seen the hexa-core Mali-T628 perform in the Galaxy Note 3 and Galaxy Tab S but when it comes to phones it easily tops the Adreno 320 and Adreno 330 devices in GFX Benchmark, both on-screen and off-screen. For the on-screen tests do keep in mind that the Galaxy Alpha is rendering at only 720p - the LG G3 is working with four times the number of pixels and even the 1080p phones have to push more than twice the pixels the Alpha does. The complete browsing experience as measured by BrowserMark 2.1 is a few notches below the top, which is surprising considering the resolution difference plays a role here, too. Note that we used the Samsung-modified stock browser for these tests and not Chrome. Overall, the Samsung Galaxy Alpha shows proper flagship performance, even chart-topping performance in certain tasks. The Exynos 5 Octa 5430 chipset finally brings Samsung's homebrewed solutions back to champion shape after falling behind Snapdragon 600/800 last year. One thing we should note is that the chipset can run hot while doing tests (they all do) and the heat is easily transferred to the external metal frame. Metal is a lot more conductive than plastic, which means you feel the heat from the chipset a lot more while holding the device than you do with plastic bodies. The Samsung Galaxy Alpha comes with a 12MP camera. Samsung hasn't had a 12MP shooter in its lineup for ages so the Alpha isn't just borrowing the camera of another Galaxy. The image sensor has 16:9 aspect ratio, meaning it shoots widescreen photos natively. The interface has been lifted directly from the Galaxy S5. The right column holds the essential keys - still and video shutter keys, the Mode button and the gallery shortcut. The left column has the front/back camera toggle, selective focus, HDR and settings shortcut. The middle two shortcuts are customizable, the top and bottom ones are not. The Mode button is the other place you can quickly access shooting modes, including Panorama, Shot & more, Virtual tour, Dual Camera and Beauty face. Shot & more combines Best photo, Best face, Drama shot, Eraser and Panning shot. Dual Camera takes a photo with both front and back cameras simultaneously. Virtual tour shot is similar to panoramas except you can move forward, turn left or right, move some more. Selective Focus takes two shots and processes them so you can photograph a close-up subject and blur the background or blur the object and keep the background in focus. The third option is everything in focus, here's how those options look. You can download new camera modes from the Galaxy App store (like Surround shot, a spherical panorama mode). Here are some camera samples taken with the Samsung Galaxy Alpha, we'll reserve comments on the image quality for the review. The Samsung Galaxy Alpha joins the elite club of 2160p shooters. It can also capture 1080p video at both 30fps and 60fps and slow motion is available at 720p resolution. Note that the slowest option (8x) drops the framerate of the resulting video to 15fps, use 4x if you want to keep it at 30fps. For 2160p videos the Alpha camera records at 48Mbps bitrate, matching the Galaxy S5. Interestingly, audio recording is done at 256Kbps, double the bitrate the S5 uses and matching the venerable Nokia Lumia 1020. Total bitrates go down from there - 28Mbps for 1080p@60fps and 17Mbps for 1080p@30fps. The audio bitrate remains unchanged. An important thing to note is that switching to 2160p video mode puts an upper limit on video length - 4 minutes (instead of the usual 5) - and disables certain features like Dual Camera, HDR, video effects, taking photos during video capture and video effects. The classic rivalry has been between the Galaxy S and the iPhone but the Galaxy S also has to fight off Android flagships too. Now Samsung has introduced a phone to specifically battle the upcoming iPhone but a quick glimpse at it reveals it may pose a serious competition to the Xperia Z1 Compact, too (or whatever mini phone Sony comes up with this fall. The exposed metal on the sides of the Galaxy Alpha gives the phone a sense or rigidity that plastic never quite manages. Even so we struggle a bit to call the Alpha a premium device - the plastic on the back and the design of the front are very much standard Galaxy affair, from mid-range to flagship. Samsung's ubiquitous design is hurting the Alpha a bit, you have to tell the uninitiated that this isn't just another Galaxy S mini. This was perhaps a perfect opportunity for the South Korean giant to shakeup its design language. That said, the Samsung Galaxy Alpha has proper flagship specs - the chipset is a little speed devil and the 12MP camera looks very promising. The phone also brings blazing fast connectivity, the trendy fingerprint reader and a heart rate monitor to boot. The only place where the Alpha falters seriously in terms of specifications is the measly battery capacity and the lack of a microSD slot. We feel that engaging the Ultra Power Saving Mode might become a way of life for Alpha owners though. We finally got what many were asking for - a metal Galaxy flagship. It's metal only on the sides but that worked well enough for iPhones, Xperias and Lumias. Whether the Galaxy Alpha can rise above its worn out looks (both hardware and TouchWiz software) and the screen/battery numbers is a question better left for the review. Of course, the major upgrade to Samsung's design language here is the metal chassis. The sides of the phone are exposed metal while the front and back are covered in glass and plastic, not unlike Apple's iPhone 4 / 4s and Sony's Xperias.